I was with a Project Manager friend, Steve, for a catch up this week when an old friend walked into the coffee house we were in. I introduced the old friend, Liz, to Steve and invited her to join us. After a few minutes, Liz asked Steve, "So, what do you do?" What would you have said in answer to that? If like me, your default response is to say, "I'm a Professional Services Director" (or whatever your job title happens to be) then Steve's answer may surprise you. What Steve said was a little unconventional and it made me think. So ... Steve didn't say, "I'm an IT Project Manager". Although, he is. He said, "I'm a Dad of three, I run, cycle and swim and I'm an IT Project Manager." Liz and Steve then had a conversation about parenthood and how Liz used to swim for the school and county teams, Steve said he did too. It was like they'd known each other for years! I struggled to get a word in edgeways! After Liz had left I talked with Steve about his response and he told me that for years he too had trotted out that same answer that you and I would have given. It had often led him down something of a conversational cul-de-sac. If the person he was talking with was interested in IT Project Management they would have a great chat, but if they weren't, then what followed was rather awkward. "And anyway," said Steve, "she asked what I do. I do more than manage IT projects!" He's right, of course. Yet we all answer this question in this manner. We all define ourselves and each other by our jobs but we are all so much more. I started to wonder whether Steve might actually be onto something and if by defining ourselves in this way we limit our capabilities when doing the job. Think about this. Is there something that you do in your spare time that could be a great asset to you and your project management team? 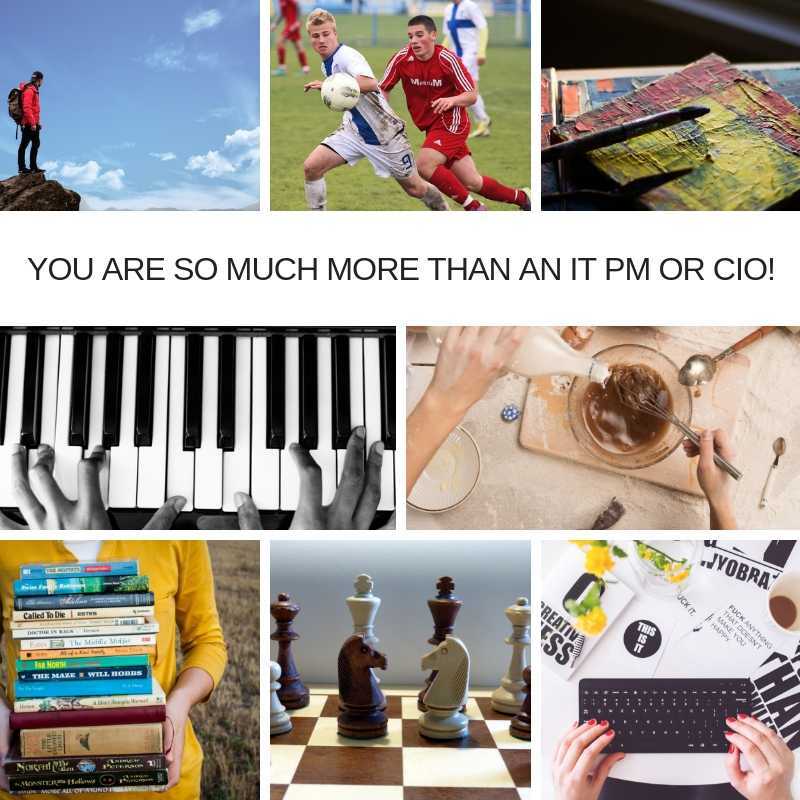 Could your hobby be your unique IT Project delivery secret weapon? I asked a few project management contacts and it quickly became clear that everyone has something that they could (and should) be bringing to the party.Here's my favourite seven! 1 - The creatives! Sal is a painter, Alli bakes the most wonderful cakes from scratch and Bex can make a piano talk! They are all incredibly creative and, let's face it, often as a Project Manager - you need to be. Creative minds are great at reframing problems and imagining solutions that seem to come from nowhere! Bex's dedication to her piano playing also shows a keen sense for attention to detail - I've never heard her play a "bum note". 2 - Rich does mountain climbing! Project Management is all about risk, if you take part in a high-risk hobby like climbing up the face of a cliff then you have extra project management skills in your locker. You’re not afraid to take risks, or at least you have the ability to weigh up risk when it matters. If you can do this when your life is on the line then doing it within the context of an IT Project will be a walk in the park!! You are also great at picking out the best route from a range of options and available data (ascending a cliff face that might be choosing an adrenaline-inducing climb over a boring safe path and in IT Project Management it might be outsourcing project delivery to Project Management as a Service talent rather than sticking with in-house resources). 3 - Michelle does endurance sports which need real perseverance and persistence. Driving yourself forward when all you want to do is quit is a great character trait that every Project Manager needs and something that everyone looks for in a leader. Indeed, Michelle did deliver a project last year against all the odds, while many project managers (I think I count myself here) may have thought of throwing in the towel, Michelle was convinced that she could achieve a successful outcome. 4 - Emma is a legend at chess! The strategic qualities of a chess player, thinking many moves ahead to beat your opponent are exactly what you need to win at Project management. Strategic and logical thinking, reasoning are all great skills. If you use them in your hobby, you need to bring them with you to work. 5 - Dean, Pete and Malc all play football. Anyone can say that they are a team player or appear to be one (especially when their monthly wage depends upon it)! These lads live it every Thursday night and the camaraderie that they bring to their project management operation has seen them through much diversity over the years. These lads have each other's backs and will go the extra mile for one another, sometimes that can be the difference between winning and losing, both on a five a side footie pitch and in an IT Project. 6 - Hayley is a blogger. She actually blogs about parenting but it's not the subject matter that counts it's the fact that she has such confidence in her writing that she happily publishes it online for all to see. Clear, concise written communication is key to project management success. A well-written brief can deliver a template for success and a proposal that clearly sets out business case benefit can be the difference between a green light or rejection! 7 - Ellie is a prolific reader. She loves novels but always has a motivational or self-help book on the go too. What does this bring to Project Management? Well, when you find that your in-house capabilities are struggling to cope with project challenges you're going to want a great researcher to enter the Project Management as a Service sector and source solutions. Readers are great researchers! You are much more than your job title! By not bringing all of you to work, could you, your project team and your employer be missing out? So, let me ask you again - what DO you do? ?